Be the first to share your favorite memory, photo or story of KALLEN. This memorial page is dedicated for family, friends and future generations to celebrate the life of their loved one. 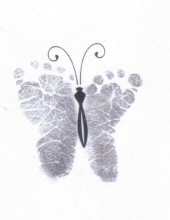 Infant son of Andrew and Amanda (Szatkowski) Titus of Greenup, Illinois went to be with the angels at 11:48 PM Wednesday January 9, 2019 at the HSHS St. Anthony Memorial Hospital of Effingham, Illinois. Kallen is survived by his parents; siblings, Elizabeth J., Cooper E and Briggs H. Titus all at home; grandparents, Ed and Sandy Szatkowski of Neoga, Illinois and Mark and Kitty Titus of Greenup, Illinois; Aunts and uncles, Tyler Szatkowski and Julia Vilchez both of Neoga, Illinois and David and Ashley Sims of Mattoon, Illinois; and numerous Great uncles, aunts and cousins. He was preceded in death by his great grandparents, Gordon and Ruth Hayton, Charles and Hazel "Beth" Szatkowski, Everett and Joan Titus and James and Sharon Hardy. Andrew and Amanda Titus,1635 Co. Rd. 1050 N Geenup, Illinois 62428. To send flowers or a remembrance gift to the family of KALLEN HARRISON TITUS, please visit our Tribute Store. "Email Address" would like to share the life celebration of KALLEN HARRISON TITUS. Click on the "link" to go to share a favorite memory or leave a condolence message for the family.